I'm now past the 48-hour mark...I'm getting very excited, and just a little nervous. I'm also all packed up and ready to go. Below is the entire contents of my backpack. There isn't much here, I realize. I would rather buy a few extra things when I get there than haul a ton of crap across the country and an ocean. 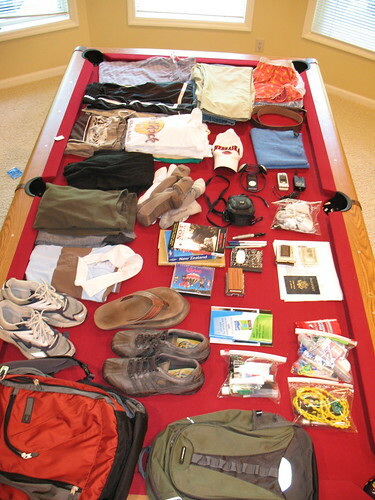 Click the photo for an interactive packing list. Along with all this is my money. Now I'm not one to normally talk about my finances, but for the sake of future travelers who may be using me as a resource, I think it's important. My savings goal was $12,000 to $12,500. Amazingly, with the help of my second job, and some side work, I've surpassed that and have more than $14,000 that I can spend on whatever I please. (I have a separate account I've set aside for whenever I settle again). I've saved all that up only since January. Goes to show what the power of focus--and living with your parents--can do. Now, I don't intend to blow through all that money in the next nine months. I am going to spend prudently, and through a combination of working for a paycheck and working for room and board, I hope to spend maybe a third of my savings. The remainder will go toward continued travels in (I currently believe) Asia, starting next (Northern) summer. Congratulations on escaping the rat race. I probably work in one of the office environments out there, but at the end of the day it's still a cube farm. Much respect for those like yourself, who are able to make the break. Travel safe and don't lose any of your s***. Cuz there ain't much there. An empty chapstick packet? Really? How's that going for you? We really miss our corporate whore and are bummed that you're here no more.